It seems what constitutes the slow-pitch strike zone needs to be revisited every so often for both league members AND umpires. As well, I want to offer the following reminder. Arguing balls and strikes can be grounds for an immediate ejection. Below is a visual depiction of the moving strike zone in slow-pitch softball. As you can see, the strike zone will vary with the height of the pitch as well as the height of the batter. Where the batter stands in the box has no bearing on the strike zone. ASA rules define the zone as front knee/back shoulder while the batter is standing adjacent to the plate. If a batter is not standing adjacent to the plate, the umpire must make a mental adjustment by taking the size of the batter and visualizing him/her adjacent to the plate. If everyone were the same size and always stood adjacent to the plate, calling balls and strikes could easily become mechanical. That, however, is not the case. As seen below, two pitches could land in the exact same spot behind the plate with one being a strike and the other being a ball (known as 'over the top'). If any part of the ball crosses any white portion of the plate, it is a strike. 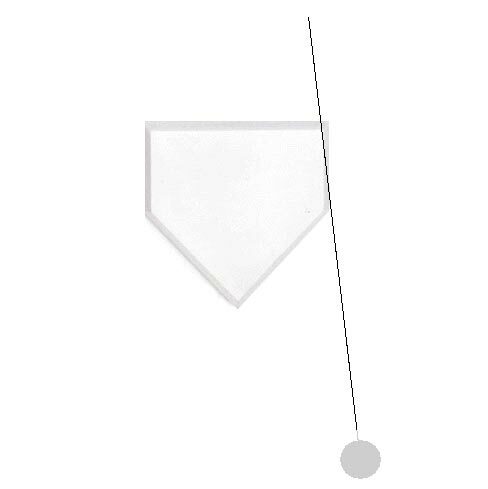 As you can plainly see in the drawing below, a pitch can land in an area wide of the plate (or mat if one is used) and still be a legitimate strike. The ground has no impact on the strike zone. Batters that point to the ground as a reference point are clueless as to what constitutes the slow-pitch strike zone. Umpires that point to the ground and use that as a reference point for the call are either uninitiated or lazy and are doing nothing more than perpetuating the players' inaccurate belief of what constitutes a ball or a strike. Unfortunately, umpires who call the zone correctly usually take more heat than those who do not. Umpires that work SBA games are asked to kindly refrain from the practice of ground-pointing. Let's also set the record straight with respect to the black edge of home plate. A ball that crosses over the black edge of home plate is NOT a strike as many may think. This black edge is what holds the white portion in place and should technically reside out of sight beneath the playing surface. The longest section that is parallel to the plate for the pitcher is 17 inches wide. The two short sides that are parallel to the batters box are 8.5 inches long. The two angled sides that come to a point toward the catcher is are 12 inches long. The black border around home plate is not a part of these measurements. Each year, umpires are required to attend a pre-season umpire meetings. One of my goals is to get every umpire on the same page - not only with respect to balls and strikes, but ALL the aspects of umpiring in our league. While I don't expect, and really don't want, every umpire to call a 'cookie-cutter' game, I do want each and every umpire to completely understand the underlying concept of certain rules - strike zone and slide or surrender to name only 2. Each and every umpire will call their game their own way and as they see fit. As long as their game falls within the guidelines as set forth by the ASA and Softball America, I will be one happy camper. Learning each umpire's tendencies will go a long way in making you a better pitcher and/or hitter. As well, your blood pressure will lower, your enjoyment level will rise and you'll develop a much better appreciation for this great game. Pitch hits the white surface of home plate and the back black edge - ball or strike? I seem to recall it being said on this message board that a pitch that lands on home plate can not be called a strike. The reasoning was along the lines that a 6-14’ arc pitch cannot physically pass through the strike zone and land on home plate (barring extremely strong headwinds, I suppose). If I am mistaken about that, I apologize – my searches of this message board did not lead me to that particular statement I am trying to recall. It’s stated in the above post that the black edge surrounding the plate does not reside beneath the strike zone, as is it is merely “what holds the white portion in place and should technically reside out of sight beneath the playing surface”. Hence, if what I recall above is true, a pitch hits the black edge at the back of the plate, but not the white surface, *may* be a strike. In a recent game, I was at the plate with a 2-1 count, and a pitch came in a bit short for my liking, so I didn’t swing. It landed on the white part of home plate, but quite close to the back edge. The umpire called it a strike. In my usual manner at the plate, I said nothing to the umpire, but briefly looked back in his direction, as I was unsure that he was aware that a pitch that hits the white part of home plate could not have passed through the strike zone. He must have seen my glance because he clarified, “It hit the black edge.” To my eye, >90% of the ball landed on the white surface, and perhaps 10% caught the black edge. Could this have been a strike, or should it have been a ball because it hit a portion of the white surface? I’m not too bothered about this, as I was still able to get a good 2-2 pitch to swing at. But I’m posting because I want to be corrected if I have any misconceptions here - I'd love to have input from anyone with an opinion. The post above quite clearly explains that where the ball lands has no bearing on the strike zone. I just thought that we had established that a ball that hits the white surface could not be a strike. Les’s statement “Learning each umpire's tendencies will go a long way in making you a better pitcher and/or hitter” contains great wisdom. This particular umpire has his own style and idiosyncrasies, but I’m more aware of them after the spring season, and for the record he does a good job overall. A pitched ball that hits the white portion of the plate should be called a ball. Even if it is possible (don't know, not a physics guru) for a legal pitch to hit the white portion of the plate, ASA rule states it should be called a ball. Most umpires will call a pitch that hits the black portion of the plate a ball because it's next to impossible to discern whether or not a portion of the ball hit the white part as well. Thanks for the clarification, Les. If the ASA rule states it, that's pretty clear - now I know!